I started the day off with some weight training with ChaLean Extreme. I’m finishing up week 1 of month 2. I needed a good protein breakfast afterwards. 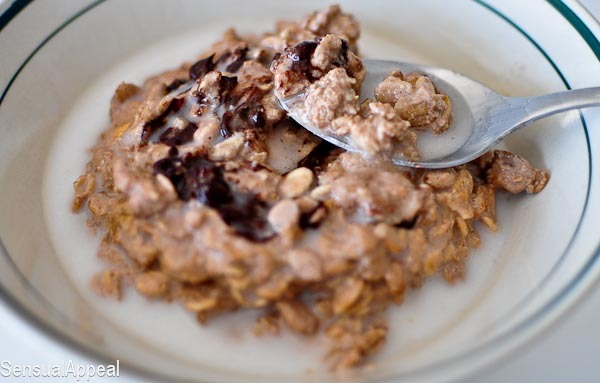 I ate half of this chocolate protein oatmeal along with some green tea. Yum. 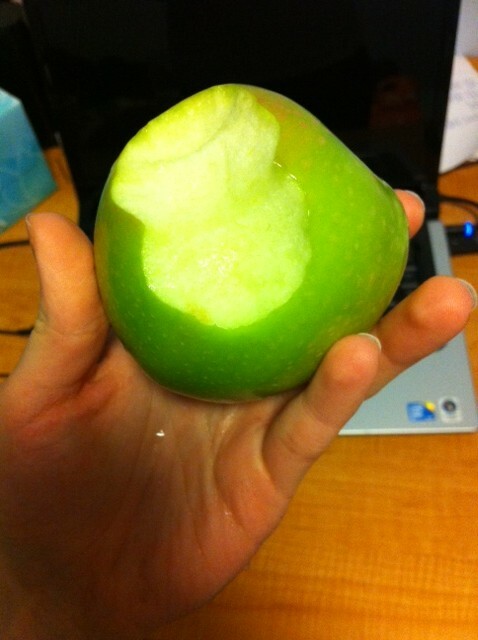 For lunch, I had a delicious and juicy Granny Smith apple. It didn’t satisfy my hunger for long, so an hour later I went for this chocolate almond muffin. For early dinner, I think I will consider it a cheat meal. In my dorm cafeteria, they didn’t have the usual “build your own salad” station and instead they had various prepared salads. Nothing else in the caf looked good so I picked a couple of salads to eat. There were also a bunch of pasta-based salads but I’m a weirdo and I’m really not that into pasta. So I picked all of the veggie-based ones. There was a sweet potato salad, grilled veggie salad, mozzarella and tomatoes, coleslaw, and I added some BBQ onions on top. Mmm calories. I really wasn’t hungry after eating that when I came home for class. But it was already 9pm and I wasn’t gonna eat when it’s too late in case I get hungry then… and if I didn’t eat now I would be hungry when I wake up before my workout (I workout on empty stomach as soon as I wake up). So I went for another apple. These are just so good…..
For a while I was seriously thinking about becoming vegetarian but I dont think I could pull it off.. I agree, apples are awesome! That salad looks right up my alley. Sweet potato? Mozzarella? I’m in. What delicious looking eats! That muffin looks so delicious!! Wow, well done to you on your vegan challenge. I don’t think I could even handle that. Everything you had looked very yummy though. 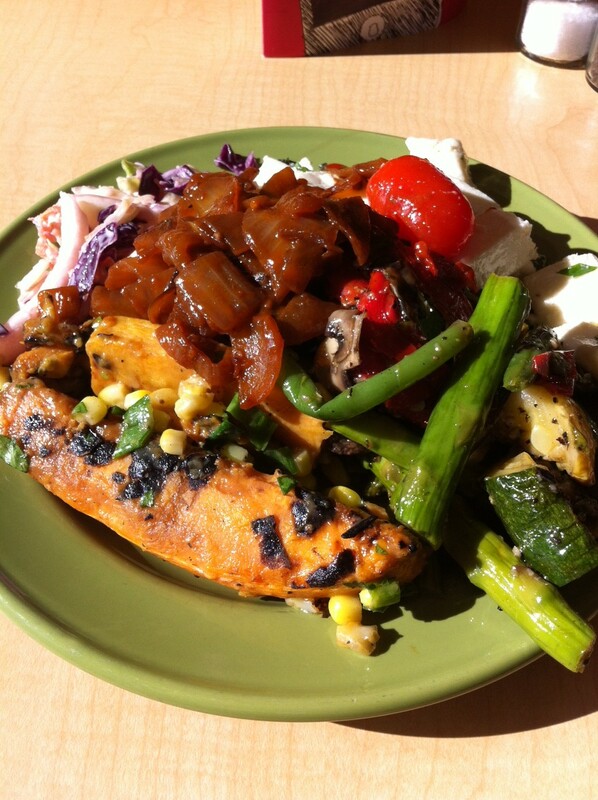 I love your colorful veggie plate! I know for sure I couldn’t handle being a vegan…this girl loves her cheese too much! But vegetarian, I’ve got done. Your dinner salad mix looks amazing! But an apple for lunch? Girl, you’ve got to eat more than that! Gotta at least get some protein in!! I thought the same thing about being vegan – it wasn’t terribly hard, but did require a lot more planning/thought. The reason I couldn’t stay is really dining out and travel. It’s super-easy at home!